Mali News #4 – The fightback begins? The current situation in Mali; picture originally of Mali Un Et Indivisible. When the end of ceasefire was announced last week, it was a worrying sign. Little did we expect the series of events following this when, on Thursday Islamists forces announced they had re-entered the key town of Kona. Government forces exchanged fire fairly quickly in response to this new incursion. This is an important strategic moment for two reasons. Firstly it showed that the Islamists felt able to expand the area under their control, and that the for the Malian Government, further Islamic advancement to the south was a line in the sand that they couldn’t allow the northern forces to cross. This resulted in a raising of tension across both sides of the border on Thursday night as civilians in Mopti and Djenne started to evacuate, fearing more violence. The fears of civilians near demarcation zone were confirmed as on Friday the Malian President announced a state of emergency in the country(fr) for an initial ten days saying, “the situation on the front is generally under control ” and called for , “general mobilization “around the Malian army. The Malian army moved north to secure the demarcation zone and beyond to re-take Konna with the support of French troops that were pledged by President Hollande. 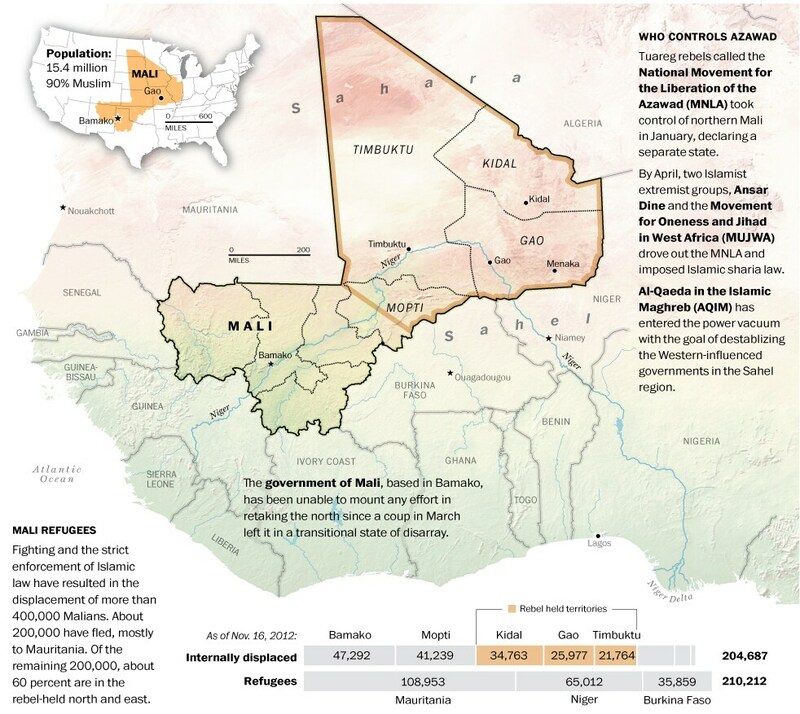 As this occurred international support across Africa and the EU swung behind Mali, but coupled with calls from the French and British Governments for all of their nationals to leave immediately. While reports of Nigerian and Senegalese troops supporting Malian troops out of Sévaré were made, the Senegalese government at least denied their troops were present. The United States also pledged support with logistical support and drones (fr). On Saturday French forces continued air strikes on targets in northern Mali and even as far south as Mopti. Saturday also brought the confirmation that 500 troops from Nigeria and Bukina Faso would support the Malian army. Friday also indicated that the French forces had lost a pilot in the fighting due to small arms fire. France has now stepped it’s national security in the wake of this intervention and their recent actions in Somalia. Despite that risk, this piece, gives an opening analysis of why France decided to act now. In the fighting around Kona and the Demarcation zone, eleven Malian soldiers were reported dead and at least eleven civilians including 3 children who drowned trying to cross the river to safety. Britain also pledged support, with the Prime Minister saying, “These developments show the need to make urgent progress in implementing UN Security Council resolutions on Mali, and ensure that military intervention is reinforced by an inclusive political process leading to elections and a return to full civilian rule”. This initial encouraging statement that thinks beyond the crisis is important, however many Malians may see the use of British transport aircraft in the conflict as more important right now. On Sunday French Pilots continued to bombard targets in Northern Mali, including Gao. While external commentators see this as, “an emergency patch in a very dangerous situation” many Malians see this as the start of the fight back, “We are very proud and relieved that the army was able to drive the jihadists out of Konna. We hope it will not end there, that is why I’m helping in my own way” (ibid). What is unclear right now is which one of these two options this is. If it is just a patch, that leaves the options of a prolonged and bloody series of battles as the status quo is maintained. If it is the fightback, the question of whether this was planned, and whether the respective armies and countries are capable of pushing out the forces of Northern Mali. What already raises concerns is the limited reporting of the civilian cost to this conflict, and whether this fast tracking means that long term thinking about the civilian cost in and after the battles have been fought will result in a long term disaster for the people of Northern Mali. Mali News #3 – New year, new prospects? On Friday the hopes of the new year was negated as Ansar Dine announced that they were suspending the cessation of hostilities claiming that the Malians had made a mockery by gearing up for war. It strikes me as interesting that the quote Reuters obtained from Ansar Dine referred to the, “Malians” which would imply to me that Ansar Dine see themselves as separate from Malians in general. An interesting shift in language, and quite hypocritical considering the reports of the underground fortresses and general fortifications being made in northern cities. To understand Ansar Dine and the Magreb this first part of a piece on the Jihadi perspective on the Mali crisis makes very interesting reading. Especially as videos continue to be published from Gao showing amputations and other punishments. In Bamako, many are continuing to agitate for war as Tiken Jah releases a single using historical imagery to encourage national mobilization in Mali. Something which Bruce Whitehouse thinks will both resonate and could be used more often in the coming months. Meanwhile in France, a judge has claimed that the continuing occupation of Northern Mali paves the way for militant attacks on France. Despite the rhetoric of the piece it’s unclear whether there is significant evidence to give this report a lot of credence. As our last update was posted, we received news that the Malian Prime Minister and his government had resigned, through coercion. News was not complete, so we’ll review what happened and look at some of the implications and analysis around this latest trial for Mali. Peter Tinti’s article gives a brief overview of the events a week ago, with suggestions that Diarra’s initial strength of being a political outsider, eventually led to his resignation as he tried to move away from Captain Sanogo’s Military Junta. International condemnation swept down on Mali and the Military Junta, with the UN threatening sanctions on a country already experiencing famine. Mali’s new Prime Minister, Diango Cissoko, started drawing up a unity government based upon the belief he could co-ordinate the retaking on Northern Mali through military means. The ICG, who have a good understanding of the situation in Mali commented that Cissoko might stand a better chance or achieving this aim. Despite the international criticism around the resignation of his predecessor, ECOWAS and other nations responded fairly neutrally to this new appointment. Clearly foreign observers are still unsure of the political stability in Bamako while Captain Sanogo is present to undermine what democratic structures that remain in Mali. In fact they still aren’t united in believe in the efficacy of the most publicised plans, as Susan Rice, the US Ambassador to the UN, calls the French intervention plan for Mali, ‘crap’. To really understand the reality of the power of the coup in March, and it’s clear continuing implications, a read of this article from Bruce Whitehouse, an American Anthropologist, gives a great insight. Bruce reported on the situation in Mali as the tsunami of the current crisis hit Mali and Bamako through his blog: Bridges from Bamako. He continues to report occasionally with excellent blog pieces. In his latest post, Bruce talks of Sanogo’s call that he can start the war of liberation before an election, as some Malians want. He also links to this BBC article which provides an analysis of the possible scenarios for Mali in 2013, which in the run up to the holiday season including the New Year celebrations in Britain, leaves much to think on for the coming year in Mali. It’s worth noting that the option of settlement through negotiation and dialogue isn’t present in the four scenarios given, despite suggestions that this route might be effective and is making marked progress. Mark Doyle gives three lines at the end of the article on the prospect. An unsettling reaction rises, and without generalizing from one news piece, you can wonder whether too many people outside Mali are brushing aside the chance for a non-violent solution that might lead to an enduring peace. Dishearteningly that position is something being seen and heard (fr) inside Mali too, although not universally. As conditions continue to deteriorate in the South and the North a thought out route to an enduring and just peace in Mali becomes ever more important. In this post Wilfred Willy, President of the Malian Community Council, kindly agreed to write a few words to open the Mali Interest Hub. We intend to continue on in this format, with experts on and from Mali providing an insight to a fascinating country currently embroiled in turmoil. Surrounding these insightful pieces we will be updating readers on the latest news from Mali. Of course the website itself is no where near it’s finished form and will develop and grow as time goes on. We hope you that you will be here with us on that journey as learn from, talk about and try to find a just and enduring peace in Mali. “I was fortunate enough to be born in Bamako the capital city of Mali, a wonderful country. Mali is well known of its diverse and rich culture, its arts and music. Mali is one of the very few countries in Africa to have produced so many internationally acclaimed musicians with, let’s not forget, 5 Grammy Awards and countless nominations to their names! The likes of Oumou Sangaré, Toumani Diabaté, Salif Keita, Amadou and Mariam, Rokia Traoré, et. play to full houses in some of the most prestigious arenas in the World. Mali also hosts 5 UNESCO World Heritage sites, the most emblematic being Timbuktu. However what always strikes me in Mali is the people: ever so welcoming and generous and happy, even in some of the most deprived and materially poor areas. The country is currently hurting because of a rebellion which started in January this year, followed by the invasion of Islamic extremists. On one hand the MNLA rebels want independence of the 3 northern regions: Gao, Timbuktu and Kidal – effectively two thirds of the country’s territory – and on the other hand the Jihadists of Ansar Dine, Aqmi and the Mujao want to impose sharia laws in the same areas to a population that is already 100% Muslim.They have started by destroying historic monuments, mausoleums; by killing, miming and beheading innocent civilians. Furthermore, Mali is also facing a political crisis which culminated in March 2012 with the coup that ousted the democratically elected president ATT. Since then the country is struggling to regain some sort of stability necessary to fight back the insurgents. 1) The opportunity to inform English speaking people on all that goes on in Mali, including news on the current crisis, but also on arts, music, culture, etc. 2) A platform for Malians and “Maliphiles” to express themselves; to inform and educate on the different issues. 3) A chance to share experience, useful information amongst people with an interest in Mali. I would like to thank all the people involved in making this website a reality and I feel really honoured to have contributed a tiny bit to its content.